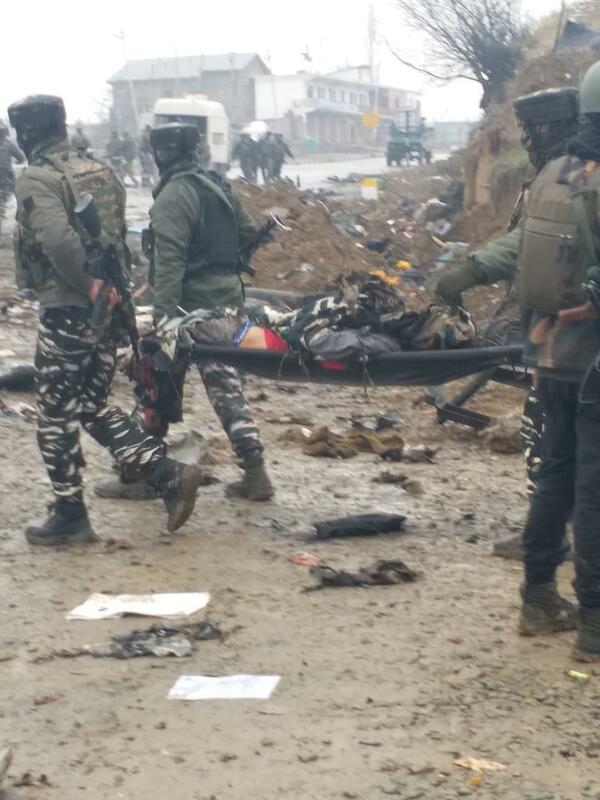 Srinagar: Four more seriously wounded paramilitary men succumbed to their injuries here at army’s 92 base hospital Badamibagh Srinagar, taking the death toll of paramilitary troopers to 49 so far in the car-bomb attack at Lethpora area in south Kashmir’s Pulwama district along Srinagar-Jammu on Thursday. The attack took place along highway when a suicide bomber rammed his explosive-laden car into a CRPF convoy in Lethpora area at around 3:15 p.m. yesterday. An official of the CRPF confirmed to GNS that four more critically wounded soldiers succumbed to injuries in the army hospital today morning. He said that the death toll of CRPF men has mounted to 49. “While a total of 44 CRPF men belonging to different battalions were travelling in one vehicle, 39 others were travelling in another one,” the CRPF official said. He said that the CRPF men belonged to 92, 17, 54, 82, 61, 21, 98, 118, 76, 45, 3 and 176 battalions. He said while none from the bus carrying 44 CRPF men survived, five of the injured among those travelling in another bus succumbed to injuries, one of them yesterday. The other injured are being treated in different hospitals. Sources said that the intensity of the blast was such that its sound was heard around 10 kilometers away. Sources said bodies of 46 CRPF men are being sent to their native villages while those of three personnel were still missing. A wreath-laying ceremony is being held at Humhama here and Home Minister Rajnath Singh is scheduled to attend it. JeM militant outfit had claimed the responsibility for the attack and identified the bomber as Adil Ahmad Dar alias Waqas Commando and he is also believed to be killed even though there was no official confirmation in this regard so far. Following the blast, the traffic on the Srinagar-Jammu highway came to standstill and when the reports last came in, the road was still closed. A police official also confirmed the closure of road. He, however, said that the traffic was diverted through Galander. Official sources said that the traffic will remain suspended on the Lethpora highway for some time as the teams from National Investigation Agency (NIA) and National Security Guard (NSG) are arriving today to assist the Jammu and Kashmir police in forensic evaluation of the scene of the attack. Sources also said that the forces along with the additional reinforcements are still conducting searches around the attack site to find the bodies of three paramilitary men which are yet to be recovered. A police officer had said forensic experts of have taken samples even as investigations have been set into motion. The officer also confirmed that yesterday’s attack was the deadliest in the 30 years of insurgency. “Even though there were major attacks in the past also like Badamibagh and assembly but this is the first attack in which there have been such a number of causalities,” the officer had said. Regarding the vehicle, the officer said that it seems to be a Scorpio or jeep. “Investigations are underway in this regard,” the officer had said.